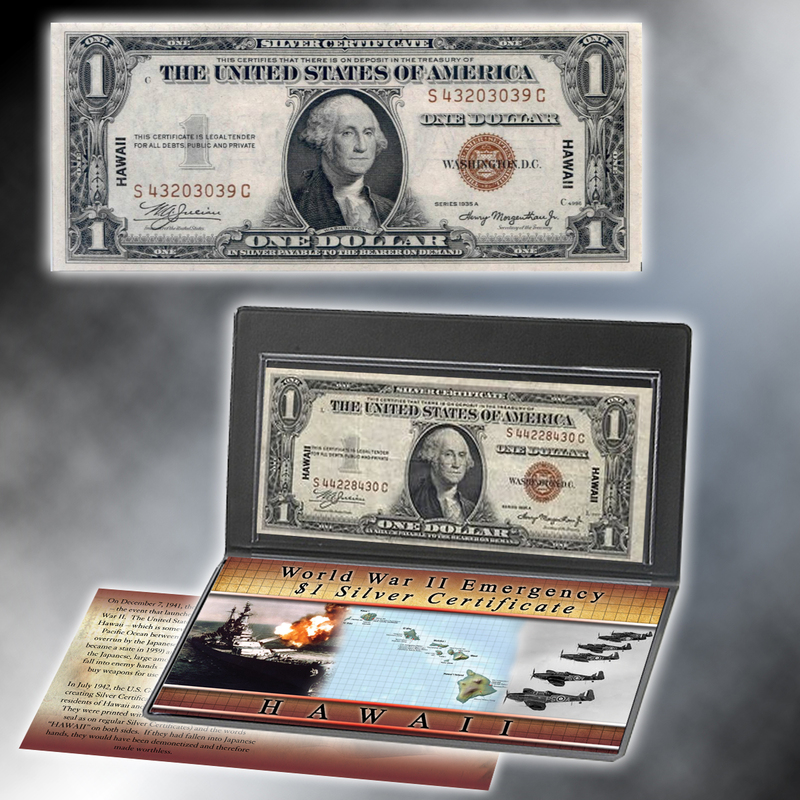 During World War II, the United States issued emergency $1 Silver Certificates for use only in Hawaii and U.S. territories in the Pacific. These scarce and unusual notes are identified by the unique brown Treasury seal and the overprinted “Hawaii” on both sides. They were issued only from July 1942 to October 1944. Unlike regular Silver Certificates that have blue seals, this note was printed with a brown seal to make it easy to identify. The “brown seal” notes were issued because the U.S. government worried that Hawaii might be overrun by the Japanese. If the Japanese had captured large amounts of U.S. currency that was identical to regular currency, the Japanese could have bought weapons and used them against U.S. forces in the war. As a result, the notes were made to look different. Had they fallen into Japanese hands, they would have been demonetized and therefore made worthless. Fortunately, that never happened. Hawaii was still a U.S. territory during the war (it became a state in 1959), and it used U.S. currency. Very few of these historic notes survived the war, making this a treasured piece of American history. 7 1/2" x 4" x 1/4"